Calvinists believe that this means that unless one is Born Again, he cannot believe in the Gospel. But that is not what Jesus said. The “least in the kingdom of heaven” is greater than John the Baptist (who was the greatest under the Old Covenant), which speaks of what the New Covenant accomplishes. (Matthew 11:11) One cannot “see” or “enter” the kingdom of God apart from being a reborn Christian, and if John the Baptist needs something more, then how much more of Nicodemus, a Pharisee? This may come as a real shock to most Christians, because it seems to go without saying, that a person is made Born Again by the Holy Spirit only after he first believes in Christ. What you are about to find out, is that the Bible indeed affirms that you are made Born Again only after you first believe in Christ. Arminianism agrees that unless God does a supernatural work in our soul, we will never choose Christ, and hence God’s Prevenient Grace of convicting hearts (John 16:8), pricking consciences (Acts 26:14) and opening hearts to respond to the Gospel. (Acts 16:14) However, that is not Regeneration. Regeneration is not about opening hearts. That’s Prevenient Grace. Regeneration is about changing hearts, and doing so in the new birth when the “new creature” receives a “new heart.” (Ezekiel 36:26) This occurs “in Christ.” 2nd Corinthians 5:17 states: “Therefore if anyone is in Christ, he is a new creature; the old things passed away; behold, new things have come.” Sproul said that Calvinism rests upon the premise that “Regeneration precedes faith.” Yet, while keeping in mind that regeneration, as the new creature, occurs when you become in Christ, notice that Ephesians 1:13 says that you do not become sealed in Christ until after you first believe in the Gospel, and hence the Cardinal point of Reformed Theology goes up in smoke. Ephesians 1:13 states: “In Him, you also, after listening to the message of truth, the gospel of your salvation--having also believed, you were sealed in Him with the Holy Spirit of promise.” So if the regeneration of being made Born Again is restricted to those who are sealed in Christ, how can a person be made Born Again (Regenerated) before he is sealed in Christ? Stated another way, if according to Calvinism, “Unless a man is made born again, he cannot believe in the Gospel,” AND IF being made born again is a facet of regeneration, AND IF regeneration is a facet of what is alone reserved in Christ, then Calvinism requires that a person become preemptively placed in Christ, in order to gain access to these vital elements, i.e. a new heart and a new spirit as the new creature (Ezekiel 36:26; 2nd Corinthians 5:17), in order to ensure that the decision of the elect may become irresistible, as in Irresistible Grace. Problem: a person does not become sealed in Christ until after he has first believed in the Gospel. (Ephesians 1:13) Hence, Preemptive Regeneration is toast. In other words, to Calvin, unless a man is made Born Again, he cannot enter spiritual life. However, if you are in the kingdom of God, you are saved. Hence, unless one is Born Again, he cannot be saved. Thus, one hears the Gospel, believes the Gospel, and is sealed in Christ unto new birth in being made Born Again, and by virtue of being made Born Again, he is saved. In contrast, Calvinism teaches that one is made Born Again in Christ, hears the Gospel, believes the Gospel, is sealed in Christ, and then is saved. Hence, Calvinism is an utter mess and ought to be scrapped. The Philippian jailor asked Paul, “What must I do to be saved?” (Acts 16:30) Both the jailor and Nicodemus understood that salvation could only be attained after they did something, namely, by opening the door to Christ who stands knocking with the supernatural power of the Gospel. Even if, as Calvinists believe, that a man can have no part in his own salvation, or he will claim that he had a hand in saving himself, the fact is that these men understood that they were responsible for first doing something to meet God’s requirement for salvation. Faith in Christ precedes eternal life (John 3:16), and the result is being made Born Again with the indwelling of the Holy Spirit. Jesus told Nicodemus: “You must be born again,” to which Nicodemus responded, “How can a man enter his mothers womb a second time?” The point is that Jesus was telling Nicodemus that he had to do something in order to become born again (not that he makes Himself born again since that is something that the Holy Spirit does), and Nicodemus understood that it was up to him to make the first move to becoming born again. This is why he asked about re-entering his mother’s womb. “How can a man be born when he is old? He cannot enter a second time into his mother’s womb and be born, can he?” However, this does not discount the fact that only God can make a person Born Again, or the fact that Jesus Christ first draws all men to Himself (John 12:32), standing at the door of our heart knocking. (Revelation 3:20) The point is that God the Father will not make a person born again until they first open the door to His Son according to John 3:16. On the other hand, if the origin of faith is being unilaterally and preemptively made born again in Christ in order to believe, as Calvinism teaches, then what could Nicodemus do but quietly wait and hope that God someday, unconsciously and secretly places him in Christ and makes him born again in order to believe? There are Christians who believe that they can be saved twice. In fact, they believe that they have been saved, and re-saved, many times over. But such a proposition would suppose that a person could be born again, and again, and again, and again, all of which must dismiss the finality of birth. The point is that in order to enter the kingdom of God, he had to become something other than what he was. Simply being among the chosen race of Israel, was not enough. Consider Luke 3:8 which states: “Therefore bear fruits in keeping with repentance, and do not begin to say to yourselves, ‘We have Abraham for our father,’ for I say to you that from these stones God is able to raise up children to Abraham.” As evidenced by the words of John the Baptist, many Jews had placed great confidence in their physical birth, and yet here at John chapter 3, Jesus had set aside the importance of physical birth in favor of spiritual birth. When a person believes in Jesus, he or she becomes “one spirit” with God (1st Corinthians 6:16-17), and that which is born of that union is a member of the New Covenant, chosen race. That means that these uncircumcised, yet believing Gentiles are now among a chosen race!, that is, the chosen race of the redeemed in Christ. To summarize, you had to be born into the elect, Jewish race, and similarly, you have to be born into the elect race in Christ. You were physically born into Election in the Old Testament, and you are spiritually born into Election in the New Testament, through faith in Christ. If you are a member of the New Testament “elect,” it is purely so by spiritual, new birth. I’ve had a Calvinist tell me that he was predestined “to be” in Christ because the Bible says so. However, the Bible says no such a thing. Rather, the Bible teaches that we are predestined in Christ. That speaks of all that we have, and will ever have, in Christ, namely that in being a Christian, even being foreknown in Christ (Romans 8:29), we have a unique calling as Christians, as well as justification, glorification, and being conformed to the image of Christ, all on the sole basis of what God the Father has in store for those who are Christians in Christ, such that when God the Father sought a place for His grace, He found none other than His Son, and that all who are enjoined to His body through faith as “one spirit” with Him (1st Corinthians 6:17), may share in His grace. Therefore, Arminian Election and Adoption are hinged upon a foundation in Christ. In fact, the whole purpose of Ephesians chapter one is to expound upon all that we have in Christ, and not what we have in the Father independent of being in Christ. If you are not in Christ, then you are not among the New Covenant elect. Unbelievers are condemned. (John 3:18) Believers in Christ are free from condemnation. (Romans 8:1) The elect in Christ are also said to be free from condemnation. (Romans 8:33) Therefore, there is no such thing as a New Covenant elect, unbeliever. Therefore, who are “the elect”? They are Christians who have been spiritually born again into a royal, holy chosen race of the redeemed in Christ. Here is a Blog discussion on John 3:3. If Calvinism were correct, then Jesus’ words would mean: “I’m sorry Nicodemus. There is nothing that you can do. If you are not already Born Again, then no matter how I explain the Gospel to you, you are just not going to get it, being held captive to Total Inability. However, I have good news for you. Since you seem interested, it might mean that you were secretly born again, without realizing it, and are just now coming to the realization that you might just be one of the elect. Calvinists are Christians by presumption, presuming that they are of the elect, while Arminians are Christians by promise, believing in the promises of God to those who believe in His Son, irrespective of an Election. Thus the contrast is of a Calvinist Presumption to Election vs. Biblical Promise to those who believe. Question: What does it mean that unless a person is made Born Again, He cannot “see” the kingdom of God? Answer: According to John Calvin, it means entering the kingdom of God. However, Calvin argues that the “kingdom of God” does not mean Heaven. Question: Why is it necessary for Calvinism to teach that people are preemptively made Born Again? Answer: That’s the $64 question. The $64,000 question is why is it necessary for Calvinism to teach that people are preemptively made in Christ? The answer is that Calvinism requires what is in Christ, namely, the new heart of the new creature, in order that the decision of Calvinism’s elect be rendered irresistible. While spurning Arminian Prevenient Grace, Calvinism teaches that only an Irresistible Grace can overcome the Total Depravity of man. Question: Is the wind blowing, analogous to the Holy Spirit electing to salvation whom He will, while passing by the rest? Answer: The analogy of the Holy Spirit to the wind, explains how a sudden change occurs within a person, that He cannot see coming, but He can feel in his heart, once He has received Christ. Question: Can a man be physically born twice? Question: What does it mean to be “Born Again”? Answer: Consider the butterfly. 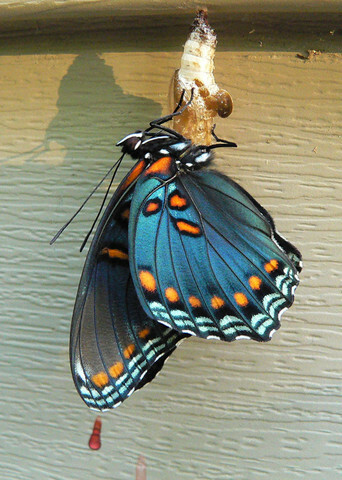 The old creature as a caterpillar is dead, and a new creature is born, being a butterfly. 2nd Corinthians 5:17 states: “Therefore if anyone is in Christ, he is a new creature; the old things passed away; behold, new things have come.” In Christ, one becomes transformed, with the old person having died, analogous to the caterpillar. Being Born Again means that we have a new nature from God, in order that by this new nature, we may do the things that please God. Prior to Calvary, no one was Born Again, just as prior to Calvary, just as no one was in Christ. Previous to Calvary, the righteous were in Abraham, and when they died, they went to Abraham’s Bosom (Luke 16:19-31), rather than Heaven. It is only when Christ rose from the grave and conquered death, that the temple veil was torn (Matthew 27:51) and access to God was granted. Question: Why tell the Jew, Nicodemus, that he must be “Born Again”? Answer: Jesus could have told him that he needed regeneration, but He instead used the term, “Born Again.” Nicodemus was already born into election by virtue of his physical birth, as a Jew, among the chosen race of Israel. However, in his secret visit with Jesus, he was stumped as to how, or even why, a grown man could be born a second time. Question: Was anyone in the Old Testament ever Born Again? 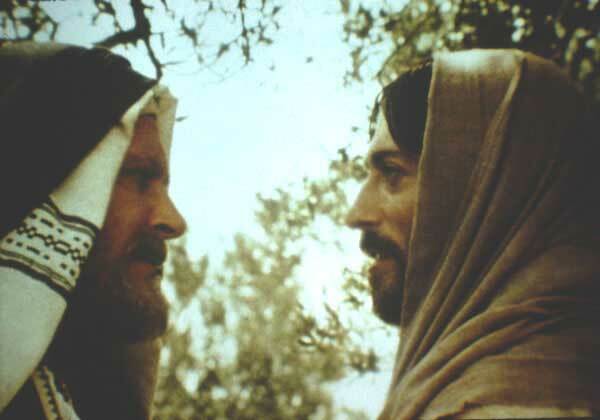 Question: At John 3, why did Jesus accuse Nicodemus of not understanding things that he ought to have known? Answer: Because the coming of the Spirit in the New Covenant was a major teaching of the Old Testament and basically the great hope of the Old Testament. Question: At John 3, did Jesus say that one must be Born Again in order to be able to believe in the Gospel? Answer: No. He said that you needed to be Born Again in order to “enter” or “see” the kingdom of God.